Swiss chocolate is selling well despite the economic downturn. It is just days before Easter and housewife Laure Bertini walks the aisles of the Manor supermarket in downtown Geneva, looking for holiday treats. "Chocolate will always be at the top of my shopping list, regardless of the economy," she says, filling her cart with gold-foil-wrapped chocolate bunnies from the Swiss maker Lindt. Although Swiss brands may not take the biggest bite out of the global chocolate market  that honor goes to the U.S. company Mars-Wrigley and Britain's Cadbury  they are widely considered among the best and most competitive in the world. "Switzerland's image sells well abroad, and nothing says 'Switzerland' more than chocolate," says Stephane Garelli, director of the World Competitiveness Center at the Institute of Management Development (IMD) in Lausanne, predicting that this comfort food will continue to sweeten the sour economy for months to come. It is too early to tell whether 2009 sales will match last year's, says Chocosuisse's Schmid. But some Switzerland-based chocolate producers are confident that the industry's immediate future is far from bleak. 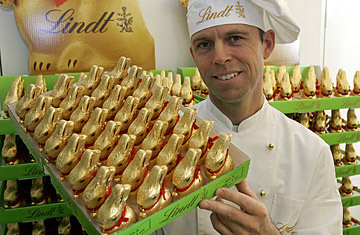 Lindt, makers of the iconic golden bunnies, predicts its 2009 sales are likely to increase by between 2 and 5%  short of its target of 6 to 8%, but still not bad in the current economy. While Nestlé, which manufactures, among other brands, Cailler and KitKat, is not releasing figures until the end of April, company chairman Peter Brabeck recently told Swiss newsmagazine Weltwoche that even amid a slacking consumer goods sector, chocolate sales are on the rise. "Now that people don't have a new television or a new car," he noted, "they eat a bit more chocolate." And it's not only Swiss chocolate makers who are thriving while others are struggling. The recession-bucking trend is also reported by Cadbury, which is expecting to deliver a 4-6% growth in 2009, and by U.S. manufacturer Hershey, whose predicted net sales growth for this year is in the range of 2-3%. "Chocolate is one of the more recession-resilient food sectors," says Dean Best, executive director of Just-Food, a U.K.-based news and information website for the global food industry. "With consumers eating out less and eating at home more, there is evidence that they are still allowing themselves the occasional indulgence  and chocolate is a relatively inexpensive indulgence." But the question of why there is no meltdown in the chocolate business may be more a matter of psychology than economics. "There is well-documented evidence going back to Freud, showing that in times of anxiety and uncertainty, when people need a boost, they turn to chocolate," says Garelli of the IMD. "That's why when the economy is bad, chocolate is still selling well." Which goes to show that chocolate is more than a candy treat  it's real food for the soul.